CHILDREN AND OTHER family members of gardaí are being targeted on social media sites and subjected to “horrendous harassment”. 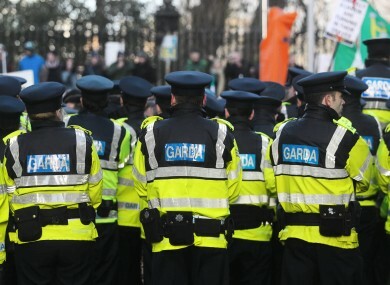 Middle-ranking gardaí will debate motions over the next two days about the impact of social media posts identifying them. Pat Baldwin, who is a sergeant in Kilkenny told reporters this evening at the annual conference of the Association of Garda Sergeants and Inspectors (AGSI) in Killarney that a number of members have approached him in recent months about social media users revealing in posts or comments where they live. It seems to be a certain level of person who targets members who they’ve had interaction with or believe they are responsible for something that happened to them. They have no specific complaint – they just want to identify that member and harass them. …introduce a criminal offence of photographing or otherwise capturing an image, moving or otherwise, of a member of An Garda Síochána in the exercise of their duty without the member’s consent and to publish or otherwise post this image on any media with intent to identify this member. A separate motion calls for the Commissioner to adequately protect and support members and their families who are being subjected to social media harassment and other forms of intimidation as a result of doing their job. We’ll have more from the conference in Killarney over the next three days. Follow @michellehtweet for updates. Email “Children of gardaí subjected to 'horrendous harassment' on social media sites”. Feedback on “Children of gardaí subjected to 'horrendous harassment' on social media sites”.